The Charter School for Applied Technologies is currently the largest charter school in the state, educating 1,675 students from Kindergarten through 12th grade. With more than 1,000 students still on their waiting list, the charter school decided it was time to expand. When the old Holy Angels Academy became available in 2013, it created the perfect opportunity for the Charter School for Applied Technologies to grow. With more than 30 classrooms, a new library and auditorium, a new gymnasium and on-site parking, the building suits the schools current needs and still allows for future expansion. This new location on Hertel Avenue will become home to the schools middle-school grades 6-8, from their existing Kenmore Campus. This move allows for the additional enrollment of 264 students and an expected 10 new teacher positions. 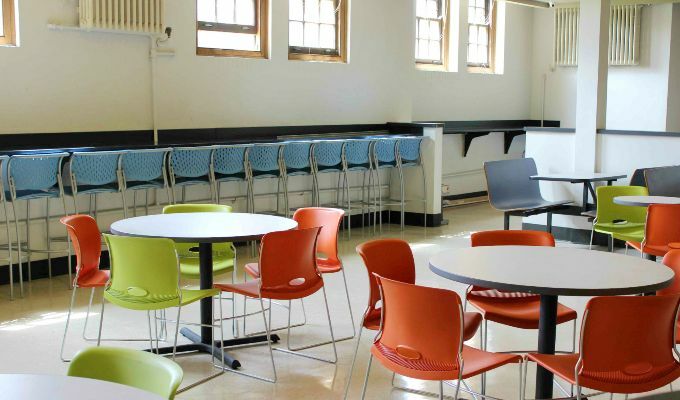 Along with the new students came the need for new furniture, from classrooms to cafeterias, administrative and faculty spaces to the media center and patio space, we partnered with the charter school to design and furnish this exciting new opportunity. 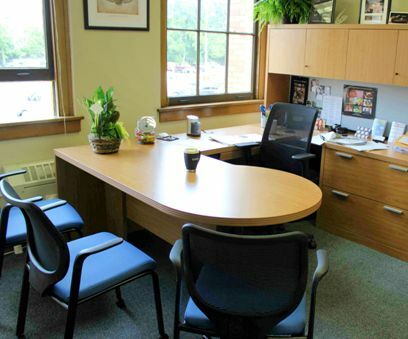 The biggest challenge in designing and furnishing the new charter school location was timing. 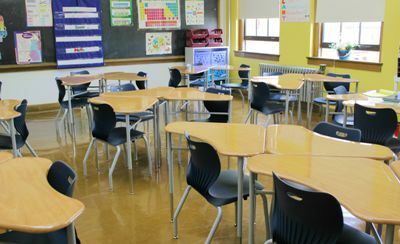 The project was initially started in late March of 2014, with installation of furniture to be completed before the start of the school year in August. For a project of this size, the timeframe required that space plans, furniture specifications, finish selections and procurement be completed in record time. Since many of the construction details were not initially finalized for a set floor plan, we focused on identifying the design intent and needs of the staff and students that would be occupying the spaces. Typical classrooms were designed and furniture options were presented, better preparing us to quickly finalize floor plans once completed. Working closely with the project architects, Carmina Wood Morris, PC., and the key representatives for the charter school including the Principal, Assistant Principal and CFO, we were able to quickly communicate and address outstanding items throughout the process. Everyone understood that time was an issue with this project so decisions were made thoughtfully but quickly. With the opportunity for growth came the chance for the school to identify and address goals for the design of the new building. Flexibility and productivity prove to be relative, so creating a modular environment that allows students to work both individually and collaboratively was a top priority. 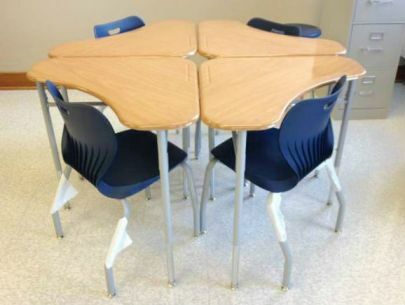 The innovative design of the HON SmartLink student desks supports several different configurations for a range of grade levels and activities. 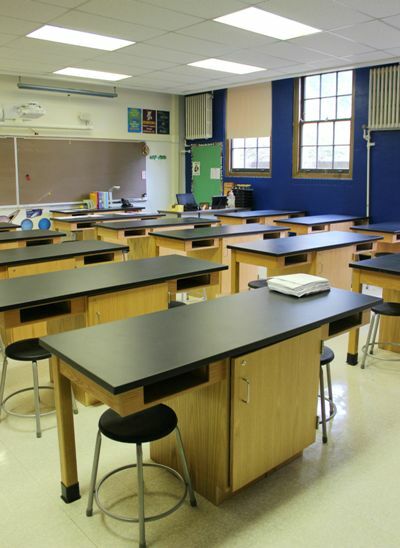 The desk easily accommodates left-handed and right-handed students and is also ADA compliant. The SmartLink chairs have a contoured design to support the way students move; allowing them to turn around, sit sideways or lean back; ultimately helping them stay comfortable and focused for longer periods of time. 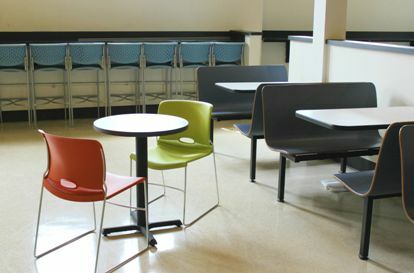 Among the many different types of areas addressed, the staff identified the Eagle Elite Café as a space that intentionally stands out in the school. Located off of the cafeteria, the café is designed to replicate a college café and is for privileged students only. Community Alpine wood bar stools were paired with HON Hospitality tables create a casual and relaxed environment for students down time. 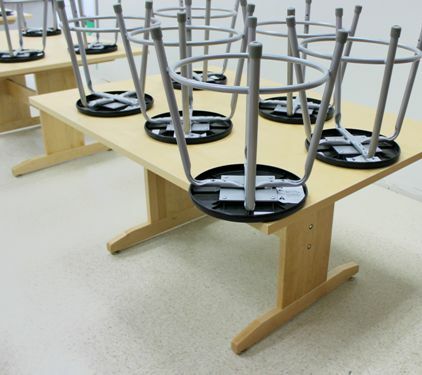 The school’s logo was engraved on the stool backs, adding a personalized touch and a flair for school spirit.